Why infants should not have ‘overnights’ with their Dad – Exactly what is the argument in favour of this ? For a start, it is claimed – and it’s true – that there is no pre-existing study(s) of what are the long-term implications associated with overnight stays at their father’s during a child’s infancy. 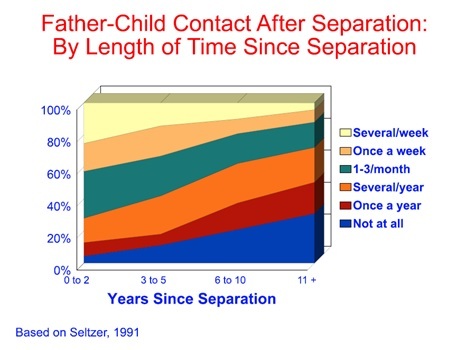 This historical lack of this basic data appears to apply to both non-custodial fathers and custodial fathers. It is therefore more or less on this tight premise alone that a child spending an overnight stay (or more than one overnight) with its fathers is judged to be fraught with unknown dangers and prejudicial to its psychological development (and so a somewhat secondary question is why, given the perceived dangers, have both non-custodial and custodial fathers have been ignored in this way). And because no one knows the long-term implications – or even if there are any – associated with overnight stays, it’s adjudged too risky to allow it. In the absence concrete data we have blitherly make asunptiosn hoping no one will question them too deeply. Given the voracious appetite for academics to find both meaty and obscure topics to delve into and to then find trhe funding, this is a strange oversight. To this latter point we have no data on positive outcomes for mother over father carer’s but we have 50 years of outcomes of children raised only by the mother and it is all mainly negative (see Popenoe D). If the answer is ‘Yes’, then we have to ask why has so sexist an approach to this field of study been allowed to continue for decades ? Did no one figure out that fathers also looked after children ? Didn’t curiosity trigger their academic minds in this direction ? This outright ban on fathers is not even a rational approach; a logical approach, nor the response of thoughtful parents. Social scientists might prefer to kick counter arguments into the long grass to ensure the continuance of their monthly pay cheques but parents aren’t so appreciative of that stance. Harder sciences, such as physics, engineering, chemistry and mathematics, can prove the existence of something, e.g. black holes & dark matter, the presence of CO2 etc, even in the absence of direct evidence. For goodness sake, even Archaeology progresses in the absence of living witnesses. One therefore has to ask, are there not many and huge previous studies constituting a mountain of evidence on the long-term associations with ‘father absences’? And the answer is ‘Yes’ there is a wealth of documented evidence spanning some 50 years (ref. Bowlby himself). Logically, one would have assumed that where there is in fact such a mountain of data and the ‘outcomes’ are all negative when fathers are not there or actively engaged with their children (as they so often are these days), can we not learn something from that data ? Can we not postulate or sensibly extrapolate ? Why is proof using the inverse or, at a stretch, the converse, so problematical ? The definition of collateral used to mean a guarantee or warranty of some sort. In Military Speke, however, it means the unintended damage, death, destruction and maiming occasioned by a conscious decision. Protagonists in the child custody arguing against father sleepovers (mainly the attachment theorists), are therefore almost unique in having both definitions applicable to them. Those in favour of inflicting the strict code of attachment theory, as devised 70 years ago, are guilty of guaranteeing the damage, death and maiming of families. “. . . . In my many years as a sociologist, I have found few other bodies of evidence that lean so much in one direction as this one . . . [two parents – a father and a mother”]. Reinforcing information comes from similar family studies, for example, Ronald P. Rohner & A. Veneziano, “The Importance of Father Love: History and Contemporary Evidence,” (Review of General Psychology 5.4 (2001): 382-405). In an analysis of over 100 studies on parent-child relationships, it was found that having a loving and nurturing father was as important for a child’s happiness, well-being, and social and academic success as having a loving and nurturing mother. Some studies even indicated father-love was a stronger contributor to some important positive child well-being outcomes. You might recall that the mountain of evidence, cited above, pointed to decidedly more positive outcomes for children living in a two parent family. There were markedly negative outcomes for children living in single parents i.e. mother, households. Even after adjusting and discounting for income differences the child with two parents was found to be streets ahead of his or her contemporary in a one parent home at every measure. If a child benefits so hugely when both parents live together, surely one can come close to those levels of positive outcome if the a child is allowed to benefit from both its parents when they stop living together as a couple ? (Indeed, this common sense view is borne out by 40 studies which are summarised in a paper by Prof. Linda Nielsen, see ‘Shared Physical Custody: Summary of 40 Studies on ‘Outcomes’ for Children‘; the Bauserman (2002) meta-analysis of 33 published and unpublished studies, respectively, https://europeanfathers.wordpress.com/2016/05/15/58/ and http://www.jointparenting.org/robert_bauserman_of_the_maryland.htm). Obstructionists like McIntosh, and Emery given his book “Two Homes, One Childhood“, point out that a paper by Adamsons & Johnnson (2013) embraced 52 studies which allegedly highlight that the amount of father contact makes zero difference but that it is the quality of the father’s engagement that matters. Other more reputable social scientists have adroitly destroyed this ‘scientific’ veneer by highlighting that Emery and McIntosh drew the wrong, or a false, conclusion from that paper (depending on whether one believes Emery was being manipulative and chose to deliberately overlook Nielsen’s paper, but which he cites in a review article in his Drozd chapter with McIntosh). Addendum: It is perhaps worth pointing out that Emery accuses the 110 endorsers of Richard Warshak’s paper (the report that so irks Emery) of misrepresenting Adamsons’ findings in the consensus report. But Professor Adamsons herself is one of the endorsers of that same consensus report – in fact the very first on the list of 110 endorsers. Presumably she is competent to judge how her colleagues represent her own research findings. Note: someone might try to claim that because Warshak stated that the endorsers do not necessarily agree with ‘every’ detail of the literature review, we cannot conclude that Adamsons is comfortable with the way her study results were presented. But it happens that her study was cited in the Conclusions and Recommendations section of Warshak’s paper, with which the endorsers did agree with every statement. (Actually Warshak was being conservative in stating that the endorsers “may not agree with every detail of the literature review.” Because he incorporated all the feedback and requests for changes from the endorsers, Warshak believes the final draft does agree with the entire nuances of the endorsers, and the Conclusions section makes repeated reference to the preceding literature analysis as supporting the conclusions and recommendations of the report). What the Adamsons & Johnnson paper pointed to was that father involvement was significantly associated with child well-being: academic, behavioural and psychological – and most strongly – linked to social well-being. Father involvement mattered more than money and more than frequency of contact. The effects were stronger for children from minorities than for white children. This is consistent with Amato & Gilbreth (1999) – another paper which Emery attempts to capitalise upon – where the quality of the involvement matters more than mere quantity of time. The types of activities that fathers are involved in and being able to nurture their children mattered more than time. Newer studies showed stronger effects – especially with young children – and, to have an effect in the quality, one must first have enough quantity of time in which this benefit can be made. In more recent studies Amato has stated in the clearest possible terms that there was a link between contact and outcomes. It would appear that even extreme obstructionists and decriers are running out of allies and are having to accept that fatherly involvement has some benefit. Is this why Emery in his presentations has resorted to citing the fictional writings of Khalil Gibran, a Lebanese-American artist, poet, and author of “The Prophet” ? Emery is today still using data from 25 years ago as this graphic (left) taken from his 2016 presentation demonstrates. In addition, he fails to tell his audience that in his study the outcomes for children, whose parents had gone to mediation had no better scores on ‘well being’ than those whose parents didn’t go, by the time those children had become young adults (for more of Emery inconsistencies see Appendix 1). Could it be rigidity of thinking that prevents social scientist from drawing proper conclusions from the work of Popenoe et al and applying it to post divorce children custody cases ? Or is it “silo” thinking of the worst kind ? What we really want to know are the long-term ‘outcomes’ for infant who overnight with their fathers. We have long known the pluses and benefits, i.e. the long-term ‘outcomes’, for older children who are allowed to spend time with an engaged father (ref. pioneer in these matters Patricia Morgan, 1995). The data for this aspect are broad and deep compared to narrowly focused data for babies and toddlers aged under 3 or 4 which is not so profuse. There are relatively small studies but there are no longitudinal studies. Warren Farrell’s “Father and Child Reunion” even in 2001, recognised a knowledge and data deficit and sought to bring together many under-publicised if not suppressed papers. Most of the opposition to a father’s involvement with child parenting appears to stem from those academics that not just revere but idolise the ‘attachment’ theory, first mooted some 70 years ago courtesy of Anna Freud, Ainsworth and Bowlby et al. The key dates for the advancement of this theory are; 1932, 1952, 1958, 1969, and 1973. Attachment theory pivots on the ‘conditioning’ effect of babies seeking and finding human contact and feeding – all of which were provided, universally, in that era, by mothers. That era was prior to Equal Pay laws and a husband’s income was sufficient to be a household income (unlike today when two incomes are needed to equate to a living household income). The presumptive backdrop was one of maternal care with crucial ‘learned behaviours’ and an unspoken association with only mothers. Originally described by Bowlby (1958) as an adult supplying and satisfying a baby’s wants and needs. The presumption was made that this was the mother’s sole role – it later had to be amended to include to include fathers or another adult. This change was more or less forced upon the theory by the realities of life, e.g. orphans, widowed fathers, etc, though some, like Sir Michael Rutter, had long pointed out the flaws and shortcoming in the original theory (indeed, Bowlby himself later recanted). Apparently, there is still a surprisingly large rump of old school attachment theorists who are far from willing to embrace the ‘facts of life’ and the need for change. This then, is the primary reason why Shared Parenting and Shared Residence after divorce has not occurred in many countries. There are signs of slow but increasing change. Texas-based Prof. Warshak wrote a paper in 2014 which was supported by 110 well-respected developmental psychologists and mental health practitioners and they all endorsed its recommendations in favour of infant overnights. The result is that the family courts, custody evaluators, and state legislatures are being pulled in two main directions, one by the old grisly guard of un-reconstructed attachment theorists and in the other by the ‘Young Turks’ epitomised by Warshak and Nielsen. And while this 3-cornered battle is dragged out high in the clouds it every day impacts separating families here on the ground. Where shared parenting has been permitted, e.g. Belgium, France, Australia and Scandinavia, there has been a perceptible (if slow) shift in custody awards as this graphic from Wisconsin demonstrates. NB. the small spike seen in 1987 was the result of an alteration to Child Support payments. By 2001, states Emery, 32% of Wisconsin custody agreements were for Joint Physical Custody but since this is an approximation or variation of shared parenting and the levels in the countries listed earlier which have true shared parenting are at a far lower level, one must suppose the 32% to be overly optimistic. In their latest re-incarnation the grisly old guard of attachment theorists have latched on to several recently offered policy recommendations that are against overnights for children aged under 3, based on extrapolations of suspect theory and ridiculously small sample sizes (see ‘Family Court Review’, 2011). They flow from the pen of attachment researchers such as Emery, McIntosh et al., 2013; Tornello et al., 2013. They are, in fact, a closed little group with little support from the serious side of academia, and their lack of gravitas is in no small measure due to their lack of a reasonably large sample size or of people from different socio-economic stratum. This cabal sees few difficulties with the child seeing their father during daylight hours but become horrified at any further contact as darkness falls (reading too many Bros. Grimm stories, one suspects). The graph (left) helps to illustrate the systematic frustrating of legislation seen in Australia after the passing of the 2006 legislation, a change of government and a campaign by radical feminists to dilute the progress in equality made in 2006. The lower orange line (representing “equal time”), starts well but then loses momentum. However, sole father determinations increase perhaps as a result of the 2006 legal relaxations and recognition that mothers sometimes do not want or cannot care for children, and may just want to walk away from the problem. Earlier it was stated that there is no previous study of long-term associations with overnights during infancy, but in fact there are a few studies, e.g. Braver and William Fabricius (Dept of Psychology, Arizona State University). Fabricius obtained such evidence by surveying his college psychology students together with their respective mothers and fathers. The parents completed and returned an on-line survey directly to the researchers. The study, while not large, certainly dwarfed the studies on which the attachment theorists have depended of late, e.g. McIntosh. All parents reported how many days and nights were spent at the father’s home during each of the child’s first 3 years; then from ages 5 to 10; and then from ages 10 to 15; had there been parent conflict up to 5 years post separation; and finally the parent’s educational level. For their part students reported on five measures of their current relationships with each parent, and current stress-related physical health. The following graphics displayed here show the characteristics of the respondents. The final sample of 78 cases met the following criteria: the parents had permanently separated before the child was 3, the father either had some parenting time before the child was aged 15 (N = 72), or had lived with the mother during the child’s first two years (N = 4), or had submitted a survey (N = 2), and the child had spent at most an equal number of overnights at the father’s home at age 2 to 3. 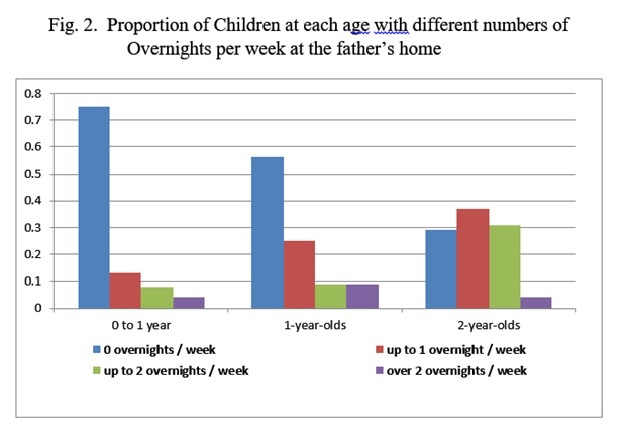 By the age of 2 to 3 years over 60% of the children in the survey had some overnights with father. The sample sizes for the 3 columns groups is as follows: N = 40; N = 53; N = 78. 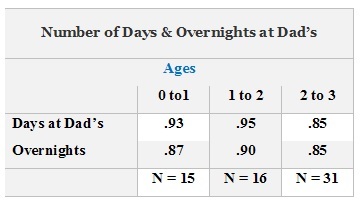 Parents agreed with each other about ‘Number of Days and Overnights at Dad’s.’ The correlations between mothers’ and fathers’ reports (all ps < .001) are shown on the right. Parents agreed with each other about ‘Frequency of Parent Conflict’. Shown below are correlations between mothers’ and fathers’ reports. These long-term positive associations between more overnights during infancy and later father-child relationships appear to be mediated by the amount of parenting time during childhood and adolescence, which closely paralleled the number of overnights that the child had during infancy. NB. The last 4 diagrams are taken from William Fabricius (Dept of Psychology, Arizona State University), 2015 notes in a presentation paper. Traditionalist aren’t bending to the new flow of evidence and hence this leads to years (Fabricius says about 15, but many would put it at 25 years), of “interesting” debate among family policy makers, researchers, legal scholars and mental health professionals. Meanwhile the immensely ethereal “interest” in potential risks (such as they are), and benefits of infants and young children of divorced or separated parents spending overnight time with their non-custodial parents (which is blindly obvious even to dullards), blights another generation. If ever there was a case to be made for assigning benign neglect at best, or dereliction of duty at worst, then this is surely it – Fiddling while Rome burns. The ‘good guys’, Kelly, Lamb, Ludolph , Braver, Fabricus, Nielsen, and Warshak, are lined up against McIntosh, Smyth, Kelaher, Wells, Long, Pruett, Ebling, Insabella, Biringen, Solomon, Tornello, but the Eminence Gris in this clique is Robert Emery. And it was in a special issue of Family Court Review (in 2011) when the gloves came off. Two decades earlier fathers were more or less ignored, written off, as not being central to the life of children. After using their sperm they served no useful purpose was the mantra of the time. It was the era of a single mother being every bit as good as a man and being perfectly well able to bring up a child without any adverse consequences. What was there that a father could give a child that a mother did not already provide, ran the argument for years and years. On the cusp of the 21st century it was the era of pregnancy for lesbian couples using donated sperm and a turkey baster. Now gay and lesbian couples can not only marry one another but father and care for children and even adopt them. How times have changed. But also at the advent of the new millennium came the equal parenting movement which challenged the mother must dominate in the home theory, and other hang-ups like the unimpeachable wife etc. Progress for homosexuals has been lightning fast compared with the tiny reforms asked for by heterosexual couples and citizens (homosexuals represent about 2% of any given country’s population). The speed of reform has been in large measure to the ‘insider’ political leverage exercised by homosexuals both in the media and politics – and Political Correctness has ensured no one of importance highlights this. Heterosexual citizens (the 97%+), have seemingly not been able to tap into this power point and where heterosexual citizens have had insider leverage they have failed to use it to the betterment of mankind. The current argument over whether to allow ‘overnights with Dad’ is a classic example. In legal terms they are eternally being asked to prove a negative, No, they do not beat up their wives, and No, they do not intend to abuse children – rememebner the Titanic ‘Women and children first’ !). In a minority of cases this will happen as it does with aberrant women who abuse others, but the question is levelled at all men and demanded of all fathers – not just the few. Does it ever rain in California ? Yes, of course it does. Homosexuals, while they may have been split about the virtues of child care and adoption, nonetheless did not stand in the way of their brethren who did want such equality. That then seems to be the major difference. Today it is recognised in all countries and jurisdictions that fathers play a pivotal role in the upbringing of socialised children. All the previous ideology of the 1990s has been shown to be false and has been abandoned – but its legacy lives on. In the 1990s there was no argument from mother’s advocates or women’s groups that most custody was awarded to them. They were happy with mother custody being 90% after divorce and the jibe of fathers representing a potential risk to their own children was unnecessary to air, with no prospect of fathers having overnight stay from their children the need for this red herring hadn’t even been thought of. By the time we reach 2011 the acceptance that fathers play a pivotal role sees a dropping of the 1990 catchphrase, ‘No fathers needed, so fathers need not apply’. 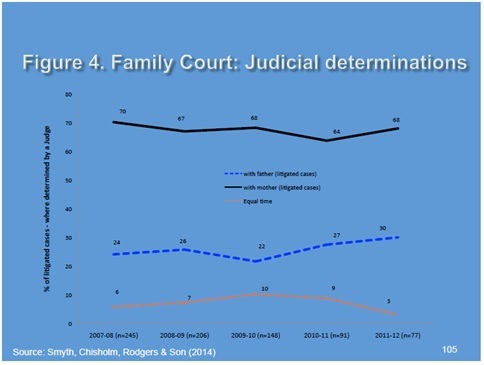 By 2011 the movement for shared parenting was well underway but making slow progress. The threat Shared Parenting posed to the mother monopoly brought forth an invidiously insidious and visceral response. To cope with this new paradigm shift it has provoked from opponents a new spectre – not that fathers pose a physical risk to children – but namely that fathers pose a psychological and development danger to their own children (meanwhile the exalted etiquette of the upper echelobns in society fail to point out to the masses that in tems of physical violence and risk to children, it is women who pose the greatest proven threat). The newness of shared parenting as a custody format – a consequence of belatedly recognising that sole mother custody does not work well – therefore answers the question posed at the very beginning of this article, namely, why are there no pre-existing study(s) of what are the long-term implications associated. Now that it is widely accepted that ‘the Emperor has no clothes’, minds will become exercised and data begin piling up. Economical with the truth ? Adamson & Johnnson (2013) – embraced 52 studies, but no, No – they concluded that father involvement was significantly associated with a child’s well-being. Academic achievement, behavioural and psychological levels most strongly linked to social well-being. Father involvement mattered more than money and more than frequency of contact. The effects were stronger for minorities than for whites. Findings were consistent with Amato & Gilbreth (1999), the quality of the involvement matters more than mere quantity of time. The types of activities that fathers are involved in and being able to nurture their children mattered more than time. Newer studies showed stronger effects – especially with young children. Sodermans & Matthijs (2014) – this is a Belgian survey of parents, custody and how conflict is significantly related to child well-being. The Dutch population are overwhelmingly (70%) in favour of shared parenting and in 2006 legalised it. Emery says it embraced 506 children aged 14 – 21 but only 103 involved shared parenting – what is termed ‘joint physical custody’ (JPC) in the US. Emery puts the level of custody in Belgium at 1/. 65.5% sole mother; 2/. 13.9% sole father; and 3/. 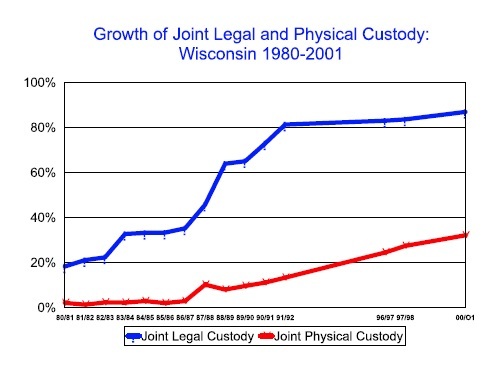 20.6% joint custody (for 2010/2011). Spruit – a Dutch survey said by Emery to be a larger study and to come to the same conclusions as Sodermans & Matthijs (2014) but in fact this is not quite the full picture. It was found that girls in involved shared parenting, or JPC, settings were less fearful than sole custody girls – and children from the former group (JPC) had better relationships with their Dads. Tornello, Emery et al (2013) – this study was based on information gleaned from the Fragile Families and Child Well-Being Study data set and although it was representative of 20 of the largest U.S. cities. It was, contrary to claims made, not the largest and /or best study to date because, as Fabricius and Nielsen have both observed, Tornello and colleagues used a sample that was almost exclusively composed of the unmarried and most fell into racial/ethnic minority groups and/or had low-incomes. Tornello, Emery et al (2014) – this Emery describes as ‘Overnights and very young children’ and as the largest study of infant sleepovers to date. The authors suggest that the public and authorities exercise caution about frequent overnights stays with fathers. However, this contains nothing new and was a riposte to an earlier criticism of their paper by Paul Millar and Edward Kruk. Buchanan, Maccoby, & Dornbusch (1996) – in this (and the following studies below), Emery tries to link high conflict with shared parenting (JPC), and he rates them as the best studies available. However, truth be told, the children in this study had better outcomes, even in higher conflict families, than the alternative he promotes. Johnston, Kline, & Tschann, 1989 – Here it was possible to point to notable differences in well-being between children from sole custody vs shared parenting backgrounds. Lee (2002) – this was interesting. There were 20 children in dual parent settings and they had better outcomes than children in sole parent care. McIntosh & Chisholm, 2008 – sadly for Emery, this ‘study’ was not a peer-reviewed published study, it was simply a summary of McIntosh’s second study which had already appeared in a government report authored by McIntosh (two citations for the price of one ?). Modecki et al., 2015 – this showed, perhaps counter-intuitively, was that children with high contact levels with their Dad and high conflict parents had better outcomes than children with lower contact and lower conflict later as teenagers and no difference as young adult except in educational level. School performance, adult attainments, lack of addiction, better mortality and morbidity rates etc. See also “Father and Child Reunion”, by Warren Farrell, for greater a number of examples and studies. Jonathan Bradshaw, Carol Stimson, ‘Non-resident Fathers in Britain’ (1997); Bradshaw and Millar (1991); Seltzer (US, 1991) suggests that maintenance and contact are positively correlated in the US; whereas Sutton (Australia), sees the two important factors affecting outlook to be income and the sensation of loss of control.